A few weeks ago I went to a high tea cooking class with my girlfriends. We learned how to make mandolins, scones, and tea sandwiches. After the cooking class, I became slightly obsessed with having an afternoon tea party of my own with great recipes that I could share with my readers. I always love making excuses to have a party to hang out my friend. How lucky was I that Lipton just came out with a ton of new teas around the same time that I was looking to have a tea party!? My friends love the High Tea Party where they got to eat tons of fabulous foods and try all the new teas. The biggest hit was the Lipton Peach Mango. That is on definitely on my grocery list from now! So yummy! I started the Afternoon Tea Party with all the new Lipton Teas. I chose these teas because they sounded like so much fun. They turned out to be amazingly flavorful. I wanted a variety of herbal, black, green and one decaf just in case anyone was avoiding caffeine. Lipton’s new black and herbal varieties and improved green teas refresh the tea experience with bold and stimulating flavors. The multi-sensory teas refresh standard tea time, creating an exciting and unique tea-drinking experience. Can I get a woot-woot!? I served the tea with a few options of sweeteners, milk and lemon so that the guests could choose how they wanted to drink their teas. No one touched the milk or the lemons which say to me that the drinks were amazing on their own! The first course consisted of tiny crustless tea sandwich which I learned to cut with a non-serrated wet knife in one motion. I made a few different tea sandwiches to accommodate different tastes. I started with the Cucumber Sandwich, which was an easy recipe that derived from the one in the cooking class. The other sandwiches are easier to make as they are just layering of the ingredients into a sandwich. I will share the recipe soon on April Golightly.com. Take the Neufatel Cheese or Cream Cheese out of the fridge allowing it to warm to room temperature in the package. Start by cutting the onion and soaking in water after chopping. Use fine mesh strainer or strong paper towel (or cheese cloth) to strain the water out of the onion. This method takes the bite out of the onion. I really want to start doing this more. Use the Mandolin to get thinly sliced cucumbers. Mix the room temperature Neufatel Cheese, 1 Tbsp chopped chives. 1/2 the finely chopped red onion, and Salt & Pepper. Add the onions and salt and pepper in slowly tasting after you add. You want to get the flavor to your liking. I always add all the onions because I love onions. Heat the butter on the stove until it is liquid. Using a small basting brush, spread the butter on the interior of the bread. Spread the cheese mixture on one slice of the buttered bread. Place the cucumbers in little three high stacks on the four corners of the cheese-covered bread. The second course is for scones served with jelly and clotted cream. Here is an awesome cranberry cinnamon scone recipe that we made a few month ago. The third course is the crazy dessert course. I did not make these incredible desserts because I am not that much of an expert. I bought them at a local bakery. Yes…I cheated!! I hope you enjoyed my afternoon tea party!! 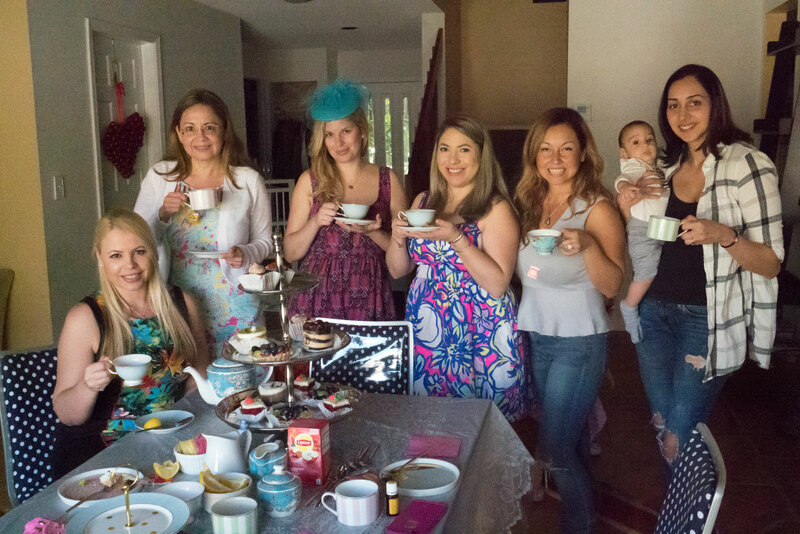 Search #LiptonTeaTime to see what other blogger did with their tea parties!! Pete’s Dragon – Teaser Trailer is Out! April, your colorful china is so pretty, especially the teapot. I’ve been drinking tea since about age 2 (English on my mother’s side!) and love afternoon tea, especially the sandwiches! Your tea party looks like a blast! Thanks for sharing at Merry Monday, hope to see you again next week!